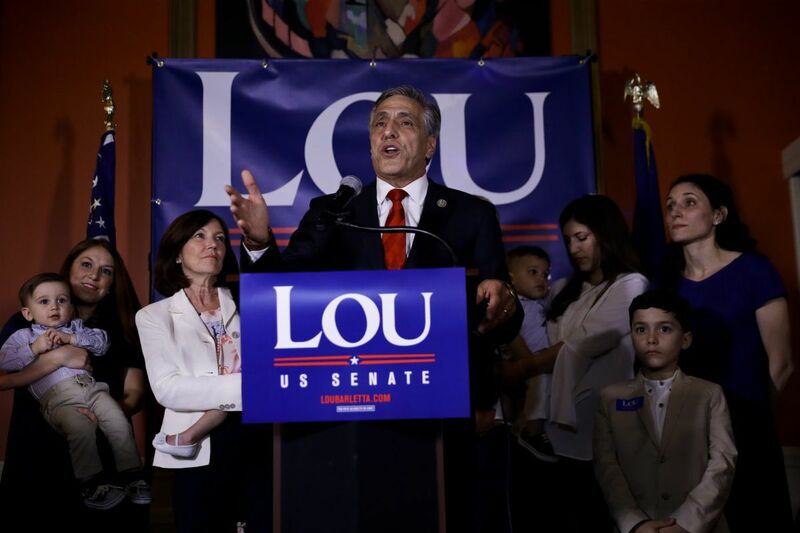 U.S. Rep. Lou Barletta, R-Pa., Republican candidate for U.S. Senate, talks to supporters in Hazleton after winning the Republican primary on Tuesday. A Republican who represented a conservative, blue-collar district sprawling from near Scranton southwest to Harrisburg, Barletta was mostly known for his hard-line stands on illegal immigration as the mayor of Hazleton. He came from a small media market, didn't raise much campaign money, and had few of the moderating touches usually needed for a Republican to win statewide. Now, Barletta — one of Trump's most vocal supporters — is the GOP nominee for U.S. Senate, pitching himself as the ally Trump needs to advance his agenda and aiming to follow the president's unusual path to victory. In his primary victory speech Tuesday night in Hazleton, Barletta explicitly asked Trump supporters to lift him to an upset that would mirror the president's stunner in 2016. "If you were a Democrat or independent that voted for Donald Trump, you cannot vote for Bob Casey, who's going to stop every single thing that you voted for," Barletta said, referring to the state's incumbent Democrat. "He will be a great Senator," the president wrote in part. "Lou is a friend of mine and a special guy, he will very much help MAKE AMERICA GREAT AGAIN!" Trump fired another blast in the afternoon, hammering Casey as a "do-nothing Senator who only shows up at election time." Barletta's rise reflects how the GOP in Pennsylvania has embraced Trump and his base, and is trying to chart a new route to winning, discarding an old formula that called for appealing to suburban moderates. "It's hard to find another Senate candidate in the country as close to Trump as Barletta is," said Terry Madonna, a pollster at Franklin & Marshall College. "It's going to be a classic referendum on Trump." "That's different now," Novak said. Along the way, Barletta was one of Trump's most loyal supporters. As he and U.S. Rep. Tom Marino toured the state, Trump dubbed them "thunder and lightning." In return visits the president has talked up Barletta's candidacy and taken aim at Casey. "That's a very, very, very far stretch," said T.J. Rooney, a former Democratic state chairman. "Whether you like the president or hate the president, one thing is clear: There's only one Donald Trump." Democrats argue that Casey, with his Scranton roots, can appeal to the working-class voters who fueled Trump. And they point out that suburban voters have responded to Trump's victory by coming out even more strongly against Republicans in local elections in 2017 and a southwestern Pennsylvania special election in 2018, in some cases handing Democrats seats they haven't won in decades. If that continues, Barletta might have to outdo Trump in rural areas. But suburban voters, Rooney said, vote more reliably than the kind of "nontraditional, crossover" voters Trump won. "You have to dig a lot deeper" to win them in large numbers, Rooney said. Barletta appears to be hoping that Trump's support, and the overall stakes for the Senate, will attract big spending from outside political groups to close the fund-raising gap. But Republican donors have a bevy of races to choose from, including ones in places like West Virginia and North Dakota that look far more competitive, and less expensive. Recent polls from Muhlenberg College and Franklin & Marshall both found Casey leading by double digits. And while Barletta allies argue that Casey's numbers are soft, Madonna noted that the senator has won statewide races five times, usually by huge margins. One mailing to supporters warned of "violent, criminal aliens." When he has visited the Philadelphia area, it has been to talk about his support for soft-focus bills to protect animals. (His website also features a tongue-in-cheek endorsement from his golden retriever, Reilly.) John Brabender, Barletta's media consultant, said the candidate will expand his appeal once the campaign begins telling voters about his blue-collar roots. Casey, meanwhile, has added a more combative edge to his mild persona, sharply criticizing Trump on nearly every issue — though offering cautious praise for the president's stand on trade. "This election will be a choice between a candidate who fights for working families and a candidate who fights for the corporate interests that stack the deck against them," Casey campaign manager M.E. Smith said in a statement Tuesday night. "Bob Casey has spent his life fighting for Pennsylvania's workers, seniors, and middle-class families." "The media said that Donald Trump could not win in Pennsylvania, and Pennsylvania sent Donald Trump to the White House," Barletta said. "Now they're saying that I'm not going to beat Bob Casey, and we're going to beat Bob Casey."